Thank you for participating in many of our editorial features over the years. 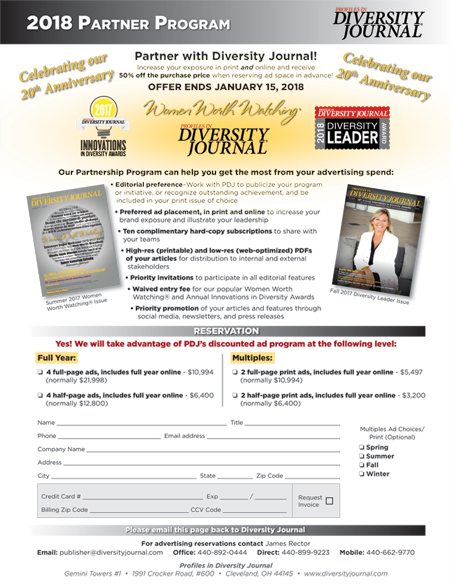 I’ve attached our 2018 Partner Program Promotion for your consideration. It offers some interesting benefits and a generous 50% discount for prepayment by January 15, 2018. This year, we are celebrating our 20th Anniversary. With your sponsorship and engagement, will be working closely with our Partners to make many interesting profiles as well as publishing our annual Women Worth Watching® Awards. We wish you a Happy Holiday season and great success and health for 2018.